Chef Matt Farmer creates a fine dining experience with a casual twist. : Apolline, located in a century-old Uptown house, is understated and elegant. Although the place was gutted and redesigned, an old fireplace that once served two rooms now is a handsome, candlelit divider for the open dining area. Chef Matt Farmer, who has worked in some of the city's best kitchens, has crafted a menu that is tailor-made for New Orleans patrons. Call them “starters” or “small plates,” but guests can make a meal from the appetizers exclusively. We suggest the charred oysters (a local obsession) and the crab mac ‘n cheese. 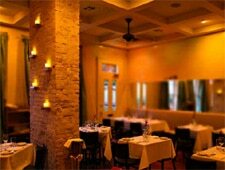 Hearty fare includes pork chops, braised lamb ragù, rotating seafood selections, filets and other red meat dishes. Goat cheese and tomato bisque will serve as a reminder that this is true Louisiana cooking, while the fried boudin balls alone may inspire a return visit. The wine list, while not lengthy, has been carefully thought out and is artfully presented in categories such as "texture, depth and rustic." Wisely chosen reds come from around the globe, including California, Chianti, Burgundy and Spain. If the brioche bread pudding with pecans and praline sauce doesn’t get your attention for dessert, you must not be hungry.